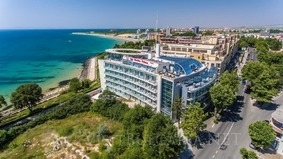 Location: The four stars Sol Marina Palace hotel is located between the new and the old part of Nessebar, only a few steps away from the most preferred Bulgarian beaches and is among the best hotels of Nessebar. With its unique location and quality of services, Marina Palace is a very good choice for relax, holiday and business events. Modern conference rooms for formal meetings, elegant restaurants and bars, comfortable rooms with stunning view will make your stay unforgettable. Wine & Dine: In the Main Restaurant of the hotel you can try rich menu of traditional and exotic dishes. The guests have at their disposal the main hall of the restaurant with 96 seats and the non-smokers compartment with 24 seats and the summer terrace. The setting is suitable for organizing business lunches, meetings and cocktail parties. Spa & wellness: The luxurious Spa Centre at Marina Palace Hotel is a modern contemporary conception for health and beauty. The Centre is not only a relaxation spot, but also a place, which represents the philosophy of the human aspiration for balanced and healthy lifestyle. The excellent weather conditions (the good sea influence on the four seasons) are wonderful prerequisite for recreative tourism. It is well known for its luxurious pool located on the last floor of the Marina Palace Hotel. The Spa center is decorated with sea design, equipped with cosy massage cabins, offering cosmetic and rehabilitation procedures. In addition, it offers sauna, steam room, Jacuzzi with sea minerals and aroma oils, fitness room, solarium. Conference halls: Marina Palace hotel offers perfect conditions for conducting business meetings, conferences, presentations, seminars, etc. Depending on the event, the seats' arrangement in the Fregata hall may be adjusted to organizer's wishes. The hotel has a spacious foyer with a unique sea view where you can carry out the coffee breaks and discussions. The two halls of the main restaurant are suitable for bussines lunches, meetings and cocktails.